"The agony and the irony: they're killing me (whoa.)" Composing a newsy note about the fam's current events. Personalizing each letter with a few special paragraphs for that recipient. Choosing a photo that captures a fun moment in our year. Addressing each card as I reflect on that person and what they have meant to me. Delivering big stacks of cards to the post office where they are sent off willy-nilly across the planet. I get huge satisfaction form this annual task. And I do it because I want to; not because I have to. But at the same time, I must confess. Sometimes I really hate this job. The entire production hangs over my head, a heavy weight of responsibility. My all-too-short pre-Christmas prep time is never long enough to get the job done. And the celebratory mood of the Twelve Days is dampened as I scramble to get this final task stricken from my month-long to-do list. Finishing my cards is always, ALWAYS a drama for me. Still. I do it because I want to; not because I have to. I've come to accept the agony and the irony of my annual Christmas card battle of the spirits, and honestly, it's become a funny little tradition all on its own. P.S. I finished my 2015 cards tonight. Wahoo!! Celebrate the Twelve Days of Christmas with me! 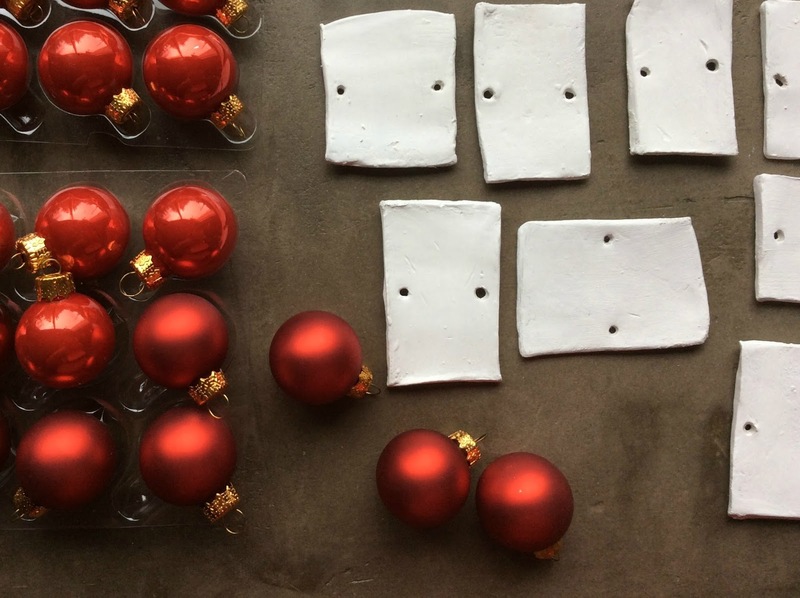 Each year as Christmas approaches, the handmade ornament wheels in my brain start to turn. Always, my goal is to produce a little trinket to share with family and friends but the fine points of each creation is totally left to my whims. Often, my inspiration comes from certain materials - wood, paper, beads - or colors or random ideas that mash up in my brain. This year, though each of those factors played a role, my ornament design was primarily a nod to the themes of my life during the past year. ^ Random rectangles of air-dry clay, roughly hewn into rectangles with a toothpick and speared twice to create hanging holes. My process was intentionally raw and unrefined; my finished product turned out nice and scruffy. 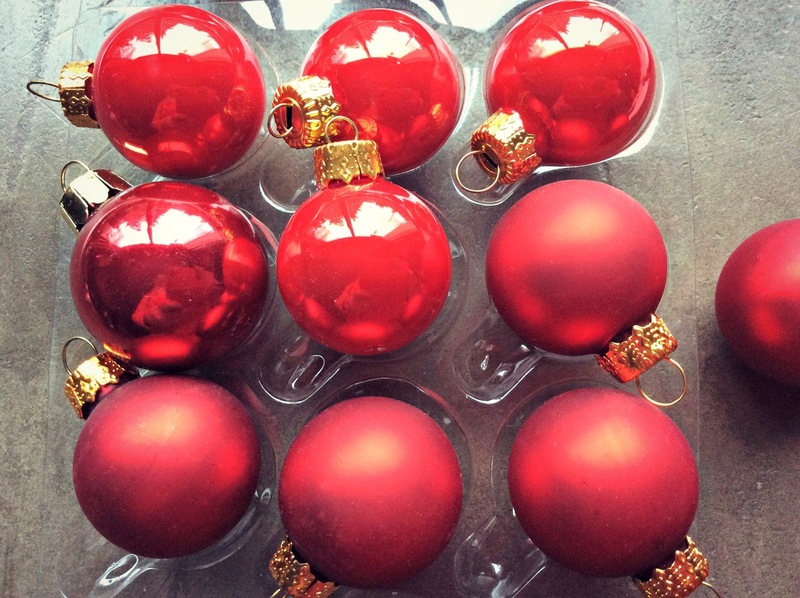 ^ Pristine, shiny, delicate red baubles with fancy filigreed fasteners. I didn't have to do a single thing to prepare these beauties for the project - they were pure and perfect from the get-go. I know. That sounds like quite a bit of philosophical baggage for a bitty little Christmas ornament to carry. But hear me out. ^ There's an undeniable contrast between the two elements that pleases me. I like mis-matchy things. More than ever before, this was a year of yin and yang for me. Some parts of my life were gilded and shining and almost perfect; others were irreconcilably flawed. Although I would usually choose to live comfortably in the merry middle, these intense and opposite experiences reminded me that there is also grace and peace to be found in the extreme highs and lows. ^ Golden cursive is hand-painted and therefore less than perfect, but provides a counterpoint to the two extremes. The detailed, repetitive brush work is like therapy for me. So whether your year was a blissfully uneventful stroll through the seasons or a walk on the wild side, like mine, I hope that you have found beauty and joy in the journey. ^ Voilà! Say hello to my 2015 Ornament of the Year. And now, for the love of Pete, let's all buckle our seat belts and hold on to the handrails as we discover what 2016 might have in store. My new wreath is pure geometry. A basic five-sided shape, repeated seven times over and connected with a bit of reinforcement. The design of this himmeli masterpiece is the love child of a traditional Scandinavian folk art and a fearless DIYer named Mandi. I simply followed her directions and voilà! A handful of brass tubes now sing with the music of the universe on my front door. And Ranger, for his part, simply noticed a beautiful chance to escape. 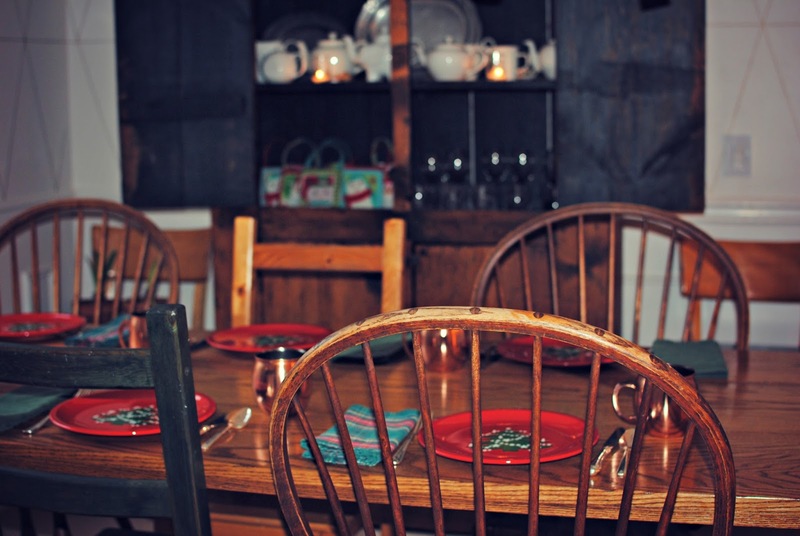 The casual observer may not notice anything particularly interesting or noteworthy about this evening's table setting for our Second Day celebration. 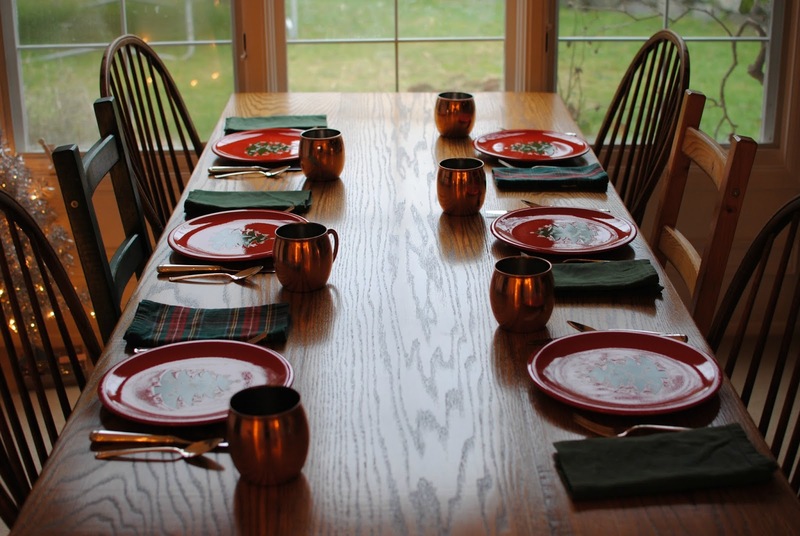 But the truth is that today marked a very special and long-overdue milestone in the history of the Streicher holiday table. ^ See those red Christmas plates? They date back to the very earliest days of our family, the first year of our marriage. Our daughters were just a dream in those days, but already my head was full of ideas about how we would play out our years together. 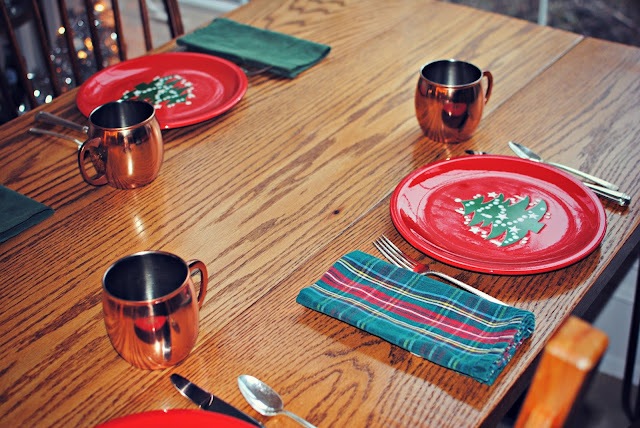 And in a fine example of my overwhelming fondness for details, I imagined sitting down to many a Christmas dinner eaten upon these plates. Just one small hitch in that fantasy. Already I was hoping for a family larger than four, but dang, those plates were expensive and at the time, a purchase of four plates was all our budget could handle. No matter, I told myself, there's plenty of time to buy more. As the family grows, I'll buy more plates and my babies will sit at them just like so many adorable little Cindy Lou Whos at the roast beast feast of the Grinch. A perfectly reasonable plan. But we all know what happens to our plans when life kicks into gear. Fast forward to last week. Sorting through my holiday dishes, I realized with a familiar pang of disappointment and regret that now - many, many years after my family expanded to five and then six members - I still have just four Christmas dinner plates. And you know, after all those years of patience and budgeting and setting other priorities, something inside of me just snapped. Without another thought, I marched my little self straight to the computer and ordered two more plates. No questions asked, no excuses tendered. I have to admit, they cost a little more than I was comfortable paying but come on. Dreams matter, and I have waited a good long time for this one to come true. My plates showed up today. The UPS man was still walking back to his truck as I ripped open the box, pulled out the plates and washed them clean. 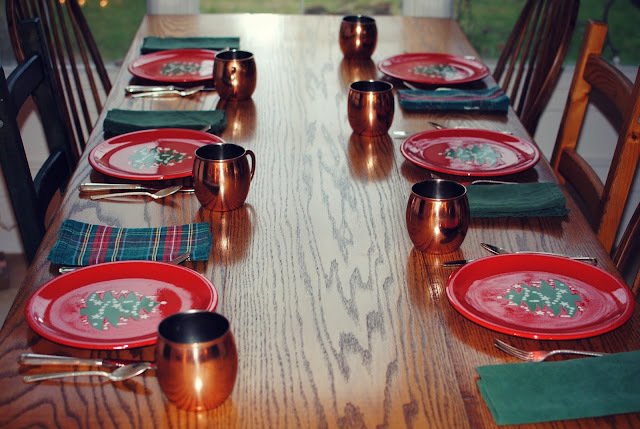 No matter that my third-born resides in Vietnam at the moment - I prepared a place setting for each member of my family. Six shining red Christmas dinner plates, trees adjusted perfectly, sat on my table. We broke them in tonight by eating our traditional Second Day of Christmas meal of Mexican-style enchiladas. The four original plates match exactly with the two new ones - I can't tell them apart and already they have blended together as a perfect set of six. If I didn't know better, I'd think they had been together all this time. 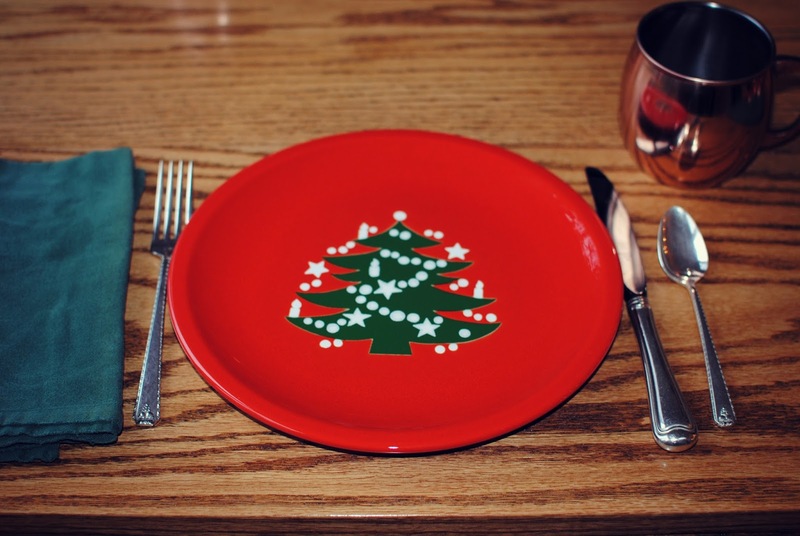 So even though I'm a few decades off my anticipated timeline, I think that the story of my Christmas dinner plates definitely worked out happily ever after. ^ When my girls were small, I entertained dreams of starting each Christmas morning off with a pan full of homemade cinnamon rolls, warm from the over and smothered in sticky deliciousness. As the years flew by, my spicy dreams were shattered by the cold, hard truth: Christmas mornings with young children are a free-for-all, and baked goods - especially those involving multi-day prep - are a laughably unattainable fantasy. Luckily, my first-born shares my ideals and has lately taken on this tradition for herself. That is a yuletide win-win if ever there was. ^ Santa came! Our stockings were indeed hung by the chimney with care, including one for Ranger and one for the cats to share. Interestingly, I went ahead and hung up my third-born's stocking, even though she is spending this Christmas in Vietnam, and Santa generously filled it anyway. What a right jolly old elf. ^ Old and new, handmade and store-bought, trendy and timeless, our Christmas tree boasts ornaments of all variety. And while we will never win any prizes for themed, color-coordinated, decor-inspired designs, we are pretty happy with all the memories that our ornaments hold. ^ There is a special sweet Christmas moment, just before the unwrapping begins, when I take a moment to stop and look, to appreciate all the thoughtfulness and generosity that has poured forth to make this special event come together. 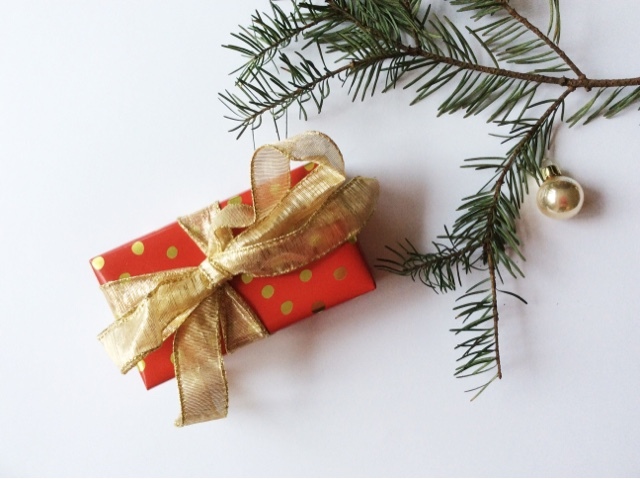 True, giving gifts is not the reason for the season, but the love and care that those gifts symbolize matters and pausing to reflect on that theme is one of my favorite Christmas milestones. 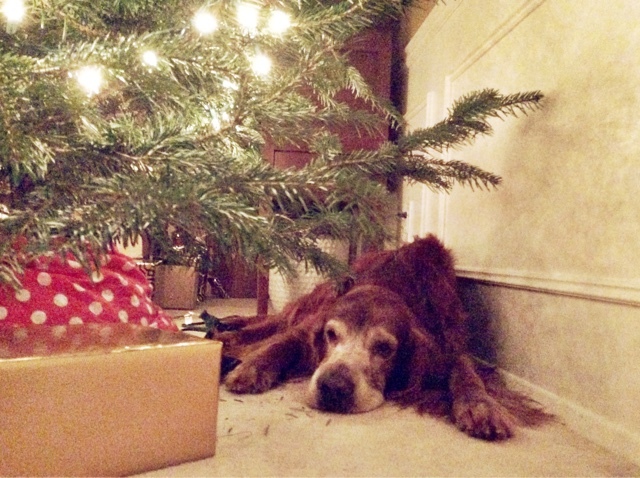 ^ Dogs love Christmas Day. There they sit, surrounded by all their favorite people, enjoying either a romp through the cast-off trimmings or an extra morning nap, depending on their age, I suppose. Ranger, distinguished elder that he is, snored pleasantly through our proceedings, and woke up near the end for a festive photo shoot. Well played, laddie. ^ While the others got a jump on our dinner preparations, my second-born and fourth-born, Ranger and I headed down to the beach. The weather was cooperative and we found a small but festive crowd of similarly minded folk also enjoying the holiday at the beach. Despite the special occasion, we entertained ourselves in all the usual beach-y ways. ^ We watched the ferries sail away. ^ We watched the ferries sail back. ^ We watched the waves roll and eddies ripple in currents across the water. ^ We stood in awe as the clouds filled the sky in threatening formations, only to drift apart and wash themselves in golden light. ^ We watched the waves crash on the rocks at high tide and shivered in our boots at the thought of its undoubtedly frigid temperatures. ^ Ranter did not share our wimpy concerns and boldly plunged in for his own polar bear swim. ^ And as we were leaving, a bald eagle soared majestically overhead. Though we are lucky enough to live in a place where we see these glorious birds all the time, it's never a small thing to watch one slide overhead, enormous wings spread as sails in the wind, circling upward on the thermals as it prepares to hunt. These are the moments that make any day worthy of celebration. ^ We arrived back home, and I noticed how our outdoor decorations stood pale and washed out against the daylight. Once the sun goes down, I know that the lights will glow warm and bright against the night, the gold ribbon on the wreaths will shine, and the strong, dark circles of evergreen boughs will appear bold and welcoming. This spirit of waiting is part of Christmas too, and even though this year's wait is over, I don't want to forget. 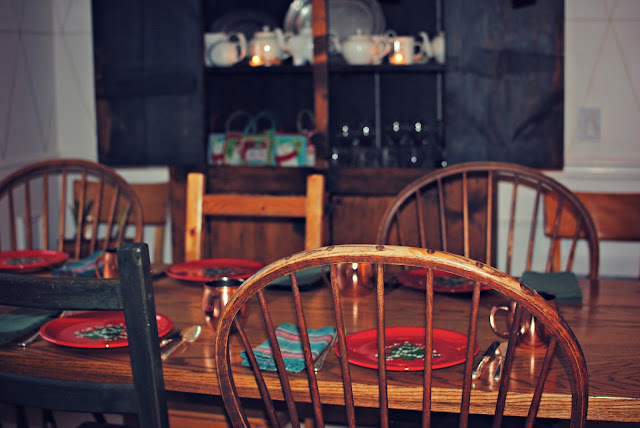 ^ And as we passed through the front door, on our way inside to cook our Christmas feast and wind down our happy day, I was reminded that this is just the start. Christmas, at our house, is celebrated for twelve full days and that means the fun has just begun! After countless years of staying up ridiculously late on Christmas Eve to get my presents all wrapped, I have finally come up with a solution to my problem. I stay up ridiculously late on the night before Christmas Eve instead. Problem solved and Happy Christmas Eve to you and me! Anyone who brings a fresh-cut Christmas tree into a home shared with a furry four-footer is guaranteed to get an interesting response. Kitties like climb up the branches, bat at the ornaments, and play with the presents underneath. Dogs often just straight up knock them over. Surprisingly, Ranger's history of Christmas tree behavior has been fairly tame. As a pup, he would bury his face in the branches and breathe in all the lovely outdoor scents lingering there. When the kittens were little, Ranger would quiveringly watch as they played underneath, sorely tempted to chase them but understanding that that would be a grave mistake. And then there was one horrible year when my darling dog repeatedly lifted his leg to the tree, marking the carpets, presents and ornaments alike as his territory. I nearly strangled him with my bare hands. But this year, Ranger has a new and much more adorable trick up his sleeve. Late in the evening, when the house is mostly dark and everyone else has gone to bed, and he is patiently waiting for me to finish up, Ranger has taken to sleeping under the Christmas tree. He is much, much too cute to scold. And I think he knows it. Yep, he sneaks around to the far side, slips into the narrow gap between the tree and the wall, then curls up underneath the branches in his cozy cave. Oftentimes, he kicks the presents out of his way, and rearranges the tree skirt to his liking. I mean, you know, a dog's gotta get comfortable. But the upshot is that my good old dog has found himself a festive little place to sleep, and as much as I tried to change his mind at first, I've decided to be okay with his new holiday habit. As long as the tree stays standing. . This dish is more commonly known as Swimming Rama but in my heart, it will always be Number 15. When a college calculus professor takes a firm stand on Thai food, you know he's going to command my full attention,. It's not often that such a serious scholar would take time away from his lecture notes to discuss such trivialities as food. But this man clearly felt so strongly about Asian flavors that he brought up the topic not once or twice, but at least a half dozen times during the quarter. Wasn't even my professor. My third-born brought reports home to me of this math teacher who regularly interrupted his heady explanations of integrals and derivatives with a recurring side note about one Asian dish in particular. "You have not lived," he pronounced, "till you've tried the Number 15 at Thai Tom's on the Ave."
Well. As a math teacher who loves to deliver a few passionate side stories of her own, I took this recommendation very much to heart. I decided that I must taste this magical elixir for myself. and the waitresses will criticize the amount of your tip...and if you happen to look Asian, they will literally chase you down the street and try to make you tip them more. I was most definitely not disappointed. Now, every six months or so, whenever I am holding midterms or final exams for my own math students, I find myself craving a Number 15. 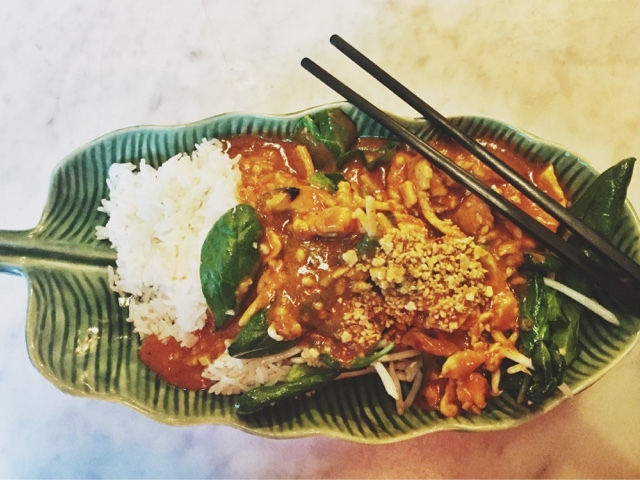 And more often than not, I head down to Thai Tom's for a dish so delicious that math professionals cannot get enough. And if that isn't praise of the highest power, I don't know what is. Oh, I love to say it and I sound so smug when I do. I'm not really much of a shopper, I insist. Shopping is just not my thing. I'd rather be making something, or spending time outside. You know, planting daisies or hiking in the wild. Nothing so pedestrian and consumeristic as shopping for this pure soul. And you know, I say these things often enough that I sometimes start to believe them myself. But every now and then, reality comes along and slaps me in the face. I'll be the first to admit that I deserve it. ^ My latest comeuppance occurred this week, when I decided on an impromptu trip to University Village. 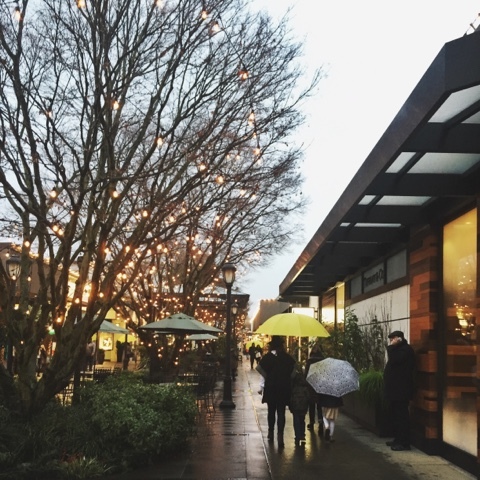 A super high-end outdoor shopping mall in Seattle, the parking lots here are full of Beemers and sidewalks jammed with blue-blooded boomer ladies stepping around the ever-present puddles in their always-exquisite shoes. To complete that picture, imagine me with my '99 Toyota Sienna and four-year-old Target combat boots. I'm not so much the U Village type. But here's the thing. U Village is the home of the Amazon's new brick-and-mortar bookstore, and I've been meaning to going to check it out ever since it opened last month. And with a secondary mission of picking up a wedding gift at the nearby Crate & Barrel, my fourth-born and I decided to rub shoulders with the Real Housewives of Seattle and venture into the fray. Okay. The bookstore was amazing. I confess that I love all bookstores, but the Amazon experience was delicious and I highly recommend. We drooled over several hundred books, deliberating and agonizing and wanting to take them all. In the end, we chose a handful for gifts, disciplining ourselves to keep the total purchase price within reason, and savored every satisfying moment of the experience. 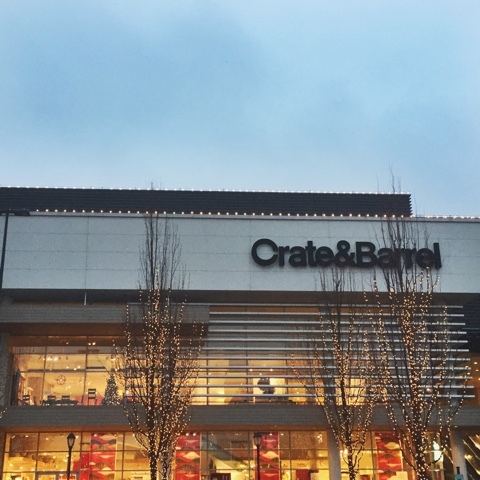 ^ Next stop was Crate & Barrel, a swanky housewares store that I used to frequent back in the double-income days before kids, when discretionary spending was part of my life. Though I have occasionally picked up a few things online, I haven't set foot in one of their stores in decades, and as soon as I stepped inside, I remembered why. Everything they sell is amazing. That's why. We grabbed our gift, and then wandered a bit. And wouldn't you know that we managed to find an easy half-dozen items that would be great for gifts. Fairly inexpensive, of course; practical things like a stainless steel ladle and cotton dish cloths. Keeping a modicum of composure, we forced ourselves to put back a $54 hand-turned can opener. In someone's world, fifty four dollars is not too much to pay in order to open a can of refried beans in style, but my pocketbook would not allow me to make that leap. Still, our purchases were magical and when we walked out of the store with our oversize iconic Crate & Barrel shopping bag, we were glowing with pleasure. ^ Our third and final stop brought us here. The magical land of Apple. I have fallen madly in love with every Apple store into which I have ever walked - which is actually quite a few - but this. 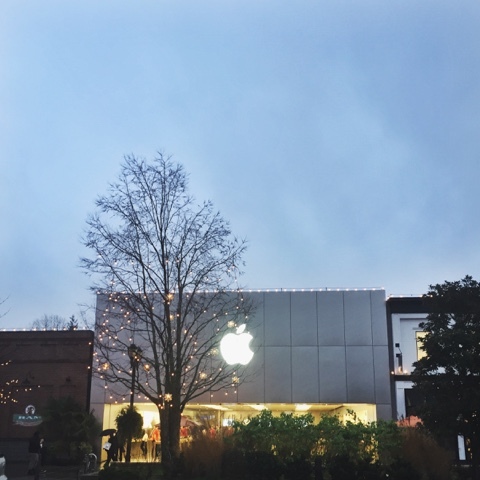 THIS store is the Nirvana of Apple stores. The floor space is huge, easily double most of the other Apple stores I've visited. Flooded with natural light, the front half of the store is a wide open expanse of flat tables, easily twice as roomy as most other Apple stores, and lushly decorated with the usual dizzying array of desktops, tablets and handheld products. Though the store was jammed with dozens of people, at least half of them were staff, jauntily dressed in holiday red t-shirts, all happily chattering away with customers. People were buying left and right, and the mood in the store was downright joyful. We made our way back to the accessory racks where my daughter began to pick out a new charging cord. Effortlessly, we found the type she needed, available in multiple lengths. As she debated her options, a red-shirted woman holding an iPad offered a friendly hello and asked if we were finding what we needed. Well. I need everything in your entire store. So I guess that's a yes. Within thirty seconds, my daughter decided on the one-meter cord - because really, an extra ten dollars for the two-meter cord is an extravagance in her budget - and completed the paperless transaction. Sad to wrap up our business so quickly, we meandered slowly back up through the tables toward the door, soaking up the festive energy and intoxicating scent of expensive gadgets. By the time we stepped outside, I was dying to buy something - anything! - and dangerously close to spending the months's grocery budget just to indulge myself. As we quietly walked back through the rain to my trusty mini-van, windows fogged up by Ranger's warm breath as he napped inside, I realized the truth about me and shopping. It's not that I don't like to shop. The reality is that I LOVE shopping, especially for elegant, expensive, and well-made things. What I don't like to do is pay for them. I've been waiting to tell this story for the past eight months. This afternoon, I realized I was not only ready, but urgently in need of sharing. So I sat down at my keyboard and began to write about it. Sometimes in life, we have relationships that challenge us. Let's be honest. All relationships are challenging on some level. Human beings are never perfect and life is all about rubbing off each others' bumpy edges. But there are some relationships that are, at their core, confusing and unsettled and never quite what you want them to be. to trust that underneath the chaos lies a healthy bond of mutual trust and love. And the years go by and still things stay the same but you keep up that optimistic, sunny hopefulness because that is just who you are. Before dawn on the South China Sea, cool mists drift over the waters. Then, someone new enters the picture. This person is in a position to observe all these relationships first-hand and has the opportunity and insight to see them as they truly are. A neutral outsider with no vested interest in one person over the others, this newcomer really just wants everyone to succeed. And one day, this person sits you down and says, "I don't know if you are ready to hear this, but I need to tell you what I see." And as you listen, this person speaks truth about these relationships as you have never heard it before. They understand, with blinding clarity, what you have done and what you have received and what you have felt. Emerald jungle wraps around our vantage point, and the screech of hidden insects builds with the morning light. And in this moment, you come to realize that these relationships are broken, unhealthy and beyond your power to repair. All the wishful thinking in the world will not make them whole. And by holding on to that naive hopefulness for all these years, you have been making yourself vulnerable to pain and dysfunction that you don't deserve. It's time, this person tells you. It's time to draw firmer, clearer boundaries around yourself. It's time not to hate or blame or demonize, but to create enough distance to protect yourself from more distress. It's time to stop sacrificing your own well-being for more misguided attempts at reconciliation with people who are simply at a different place than you are. So you draw a deep breath. And you gather up your courage and strength. And you start learning how to let go and move on. Slowly, imperceptibly at first, the light over the sea shifts from grey-blue to silvery gold. As the weeks and months tumble past, you realize each day anew just how true and right your fresh perspective feels. An ugly weight has been lifted off your shoulders, off your spirit, off your soul. But then a sad suspicion begins to creep nto your heart and mind. What if I am repeating this same mistake in my other relationships? What if I am holding on to other damaged relationships and convincing myself that they are healthy when in fact they are just as shattered and broken? What if I am not capable of knowing the difference between a healthy relationship and a messed-up pseudo-connection? And in that case, who are the people in my life that I can truly trust? This is a scary and lonely place for you to be. Though clouds obscure the horizon, the sun slowly edges up through the remaining darkness. to protect yourself from any more pain as you try to sort this out. And as more time goes by, you realize there are no easy answers. You will never know for sure who to trust. You will never have perfect relationships. You will, undoubtedly, feel hurt by how other people treat you. You will undoubtedly hurt them too. But somehow, out of these dark thoughts, a beam of light will appear. You can't just give up on everyone. You have to learn the difference between giving your heart away to those who don't deserve it, and locking your heart away from those who do. You have to dare to love people, even if you can't be sure they will love you back in the way you want to be loved back. And that all makes a lot of sense but you still aren't sure exactly what to do. Eventually, the full circle of the sun clears the mist and drenches the day in dazzling light. So you try to draw a deep breath. And you begin to gather up your courage and strength. And you hope to start learning how to let go and move on. But, you decide, the first step should probably be to write about it.